Posted 12:05 am by Jonny Pigg & filed under Gig. 4 People not profit Saltburn‘s social justice party starter‘s return this Christmas season for a very special event. We will be hosting our Christmas party extravaganza in the Marine main lounge on the 21st of December, 7.30 till late and as ever all will be free! The event will be a hamper campaign in support of Trussell Trust Redcar food bank, so will be looking for everyone to donate some non perishable food items to make up some Hampers for those less fortunate this Christmas. We will have headlining this marvellous night a very special guest in Instruments of Jah, bringing there bass heavy dub reggae sound system to rock the Marine. 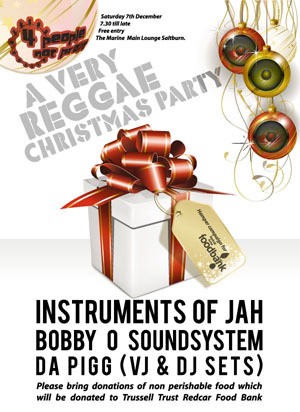 In support will be the Bobby O Sound system bringing there unique blend of dub heavy beats. On top of that we will have our resident VJ artist Da Pigg doing his usual visual magic as well as dropping a set of funky breaks. Justin York from 4 People not Profit says “We thought this Christmas it would be great to do something which would benefit local families in the Teesside area, who are currently struggling with recent brutal Tory cuts to benefits and harsh policies such as the bedroom tax which are making more and more families dependent on help from food banks’. At this event we will also be supporting local Saltburn resident Robert Reynolds who is going to volunteer to work for 14 months in St Luke’s hospital in Malawi. He has worked in the Neurosurgical HDU at James Cook for the last 3 years and is going to use the skills he has learnt to train Malawian nurses. He is trying to raise £1500 to buy resources for the hospital and needs our help to do it. So please come and give generously on the night or can donate on justgiving.com or text ROBR83 £amount to 70070.